I'm not entirely sure where, but I had heard of a new Bunnahabhain expression which would only be available in the Duty Free shops, so I thought to give it a try. It's called Darach Ùr and they had it at Heathrow T5. So I bought not only one, but two bottles (because of a special offer if you bought two bottles of any whisky). It's very nice, obviously not as peaty as the Islay Malts I usually drink, but as the name (Darach Ùr means New Oak in Scots Gaelic) suggest has some spicy oak aromas. Today we went to a chocolate shop here in Heidelberg to buy some Leysieffer chocolate. Back in June, in the comments to Watching Laphroaig Live from Islay, Onnola of Whiskymagazin.de had suggested their Halbherbe Schokolade mit Salz (Dark chocolate with sea salt). My sister had bought me some a few months ago, but now it was time to replenish my supplies. We also bought some with pepper while we were at it. Now this chocolate isn't particularly Islay (even though it goes extremely well with Islay Single Malts), but then I'm not finished just yet. While we were in the shop I spotted a chocolate by a company called Tiroler Edle. They have a Tiroler Edle Whisky Edition with six different whiskies. One of which, as you probably guessed, is an Islay Single Malt, a Bruichladdich. I haven't tasted it yet, so expected an update with it over the next week or two. 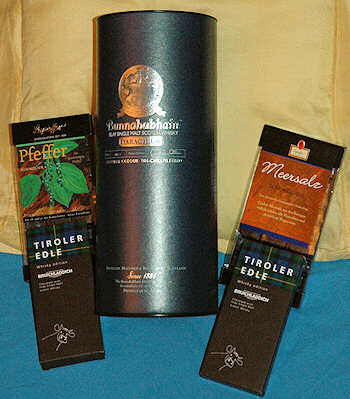 And that was my ‘Islay Christmas shopping’ this week.